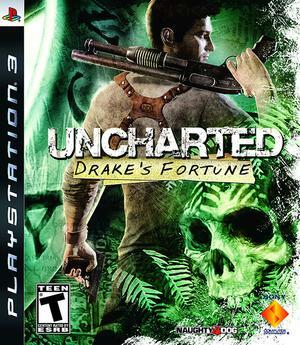 Uncharted: Drake’s Fortune is a hybrid action/platforming game that plays out as if it were a summer blockbuster movie. High production values, top-notch voice acting, over-the-top cinematics — its got it all. The game has a similar storyline to Indiana Jones movies and Dirk Pitt novels. You play as Nathan Drake, a treasure hunter who claims to be a descendant of English explorer Sir Francis Drake. Nathan is on a quest to find the famed artifact known as El Dorado, a giant golden idol hidden somewhere deep in the jungle. As any good fortune-hunting movie would have, Drake is accompanied at times by two supporting characters: Victor Sullivan, a grizzled cigar-chomping veteran who has a penchant for telling old travel stories, and Elena Fisher, a snarky reporter trying to land her next big news story. The plotline is hardly anything groundbreaking, but it is entertaining enough, especially since it is aided by some strong fleshed-out characters. As mentioned earlier, Uncharted is a combination of an action/shooting game and a platformer. Since the game was created by Naughty Dog (Crash Bandicoot, Jak & Daxter), the platforming sections are designed rather well. While some platforming games get beyond frustrating due to touchy controls and mistimed jumps, Uncharted really excels in that department. Nathan is able to make some pretty incredible jumps, and the game is more forgiving when you are off by just a little bit since it usually allows him to desperately cling to the edge and pull himself up. The platforming areas are genuinely fun, as Nate traverses some large rooms by jumping along the walls, using vines, ledges, chandeliers and whatever else he can land on. The combat, however, is where the game could use some work. The main enemies are pirates who are racing to get the treasure first, and they are all over the freakin’ place. The enemies themselves are not the problem, although some more variety would have been nice. I was more disappointed with the actual shooting aspects. I couldn’t tell you how many times I emptied a dozen rounds of an AK-47 into a pirate just to see him stumble around like he was drunk. Really, it should not take more than a few shots to down an enemy. Not a huge problem, but an inconvenience nonetheless. Where Uncharted really excels is in its presentation. It is no exaggeration when I say that this game truly feels like you are playing a movie, and it is helped greatly by its impressive visuals. Even for a relatively early PS3 title, Uncharted’s graphics are stunning. The jungle comes alive with lush green colors, the animations are virtually perfect, and the attention to detail is just remarkable. One neat aspect that stood out to me: if you end up in the water, Drake will emerge with his clothes soaking wet. Cutscenes are interchangeable from the regular graphics, as the same engine is used for both. Throw in a strong musical score and high-quality voice acting and you have a memorable experience. Uncharted: Drake’s Fortune is simply a blast from beginning to end, even with the occasional repetitive combat and agitating shooting mechanics. You are going to have to suspend disbelief with this one — which shouldn’t be a problem if you enjoy Indiana Jones at all — because Nathan Drake does a lot of things a normal guy couldn’t do. But hey, this is a video game, and playing games is all about having a good time. Uncharted is a fun ride and doesn’t require much thinking, just like a good summer blockbuster movie. I greatly enjoyed playing through the game, and I can’t wait to play its allegedly even better sequel. Alright, played through this over the Summer, and while I’m right there with ya’ on how it’s one of the few games where you actually feel like you’re in a movie and how the production values are just through the roof, I could not stand how repetitive it was. The writing, the story, the characters – all of that was great. And while the mechanics were fine, the scenarios left me unimpressed. But, dude, if you haven’t played Uncharted 2 yet, you do not know what you’re missing. Best game I’ve played in a long time, absolutely worth buying a PS3 for, just an outrageous upgrade on every front from the first game. Yeah, I could see how some people would find it to be too repetitive. I felt that way at first, but I just found the game too charming to be really annoyed by it.